The Teixeira Tech Honda TRX 450R Maximum Ground Clearance XC A-Arm Suspension Kit has been engineered to accept Long Travel Shocks. 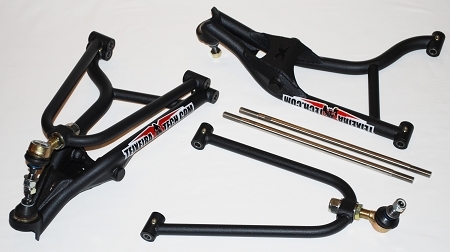 Teixeira Tech A-arms are constructed with quality TIG welded Chromoly in a precision built jig and topped off with a wrinkle black powdercoat finish for the upmost in fitment and durability. Kit includes: Upper & lower A-arms, upper and lower ball joints, tie-rods, lower circlips, upper pivot pins with seals & bushings. Notes: These Teixeira Tech lower a-arms are manufactured to accept the Honda OEM lower pivot bearings, seals, and collars. These a-arm pivot points have been designed to accept a heavy duty circlip instead of the stock retaining ring. Teixeira Tech supplies these circlips with the a-arms. Shocks are not included (sold separately). May require longer brake lines (sold separately).